I am putting my life in front of the world for the first time ever why? Because maybe my story will help bring healing to a world so full of hate, greed and despair. My name is Lori Sirois this is my story. As a young child I was raised in a household full of anger, strife, and emotional abuse. I witnessed many physical outbursts between my parents and my grandparents. I spent most of my childhood days trying to disappear and hide from the pain of seeing my Mother and Father fighting physically, yelling, screaming, and cursing in front of me. My Grandmother called me stupid and said I would never amount to anything telling me I was weak and too sensitive. I had many aspirations when I was young I wanted to play the guitar and I remember one Christmas I got a brand new guitar from Santa (yes this was at an age when I still believed in Santa Clause) On that Christmas morning my parents got into a fight with my grandmother and my guitar was picked up by my grandmother and smashed right before my eyes. My mother struck my grandmother drawing blood from her lip and all I could remember was I was devastated that day and never believed in Christmas or Santa Clause again. I never felt safe as a child or grounded. I was very shy and insecure growing up and felt different from the rest of kids my age. I was picked on by most of the kids and beat up a lot. I was a loner mostly because I did not want anyone to see the ugly truth behind closed doors. I was ashamed of my family and did everything possible to keep the other kids from seeing the truth. I was alone with my thoughts never knowing what life was all about in fact I never knew what love was. Fast-forward I dropped out of High School at the age of 16 my life at that point was in turmoil my Mother and Father separated and I was now in a state of complete emptiness with no mentor no help from any school consular or anyone for that matter. I was on my own lost in a world that was pretty big, cruel and full of deception. I was taken advantage of by many men and raped! I was lied to on countless occasions! I was in trouble. I had no life skills or no one to turn to. I went from job to job never ever staying long enough to better myself because the only thing I knew was I was insecure, stupid and alone and like my Grandmother had said I would never amount to anything. She was always in my subconscious mind you know that little voice that talks to you mostly when you don’t want it to! She had me really believeing that I was worthless sad but true. I never felt whole or safe. I tried to go back to school but again I quit and never followed through because I failed the courses so after that I never went back. I was a high school drop out with no future, and no hope of a future. At the age of 18 years I received a phone call at work. I was working a security job at the time and drinking a small coffee when the voice on the other end of the line was my Mother’s telling me that my Father had been murdered. I remember dropping my cup of coffee onto the floor and I fell to my knees in tears, I was again devastated and this time it took it’s toll on me. For years I was walking with anger and no one to help guide me so I turned to Alcohol. I started drinking heavily in my 20’s and 30’s it was the only thing that took away my pain even if it was only temporary it was the only thing I could count on. I was thrown in jail several times because of drinking and driving. I was thrown in jail for fighting while drinking and I was I in jail the majority of my early 20’s and early 30’s. I was lost, hurt, angry, bitter and completely out of touch with reality. I still felt like that little girl so insecure and lost never knowing or knew what life was all about. I never went back to school or finished anything in my life even though I had tried, and tried. I ended up failing at everything I did or touched this included my relationships with other women. I did manage to straighten out my life somewhat, but I always walked with shame and fear. 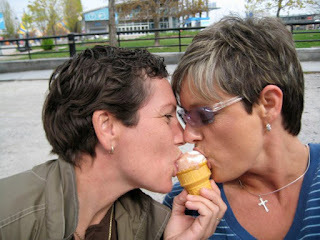 Now I am 46 married to a wonderful woman from Montreal who loves me for who I am and never judges me for my shortcomings. I am so grateful to GOD for her and I know NOW what LOVE really is. I know that LOVE is not supposed to be violent, shameful or conditional. I know now that love is the foundation to happiness and peace, I finally found the love of my life the ONE who completes me the one who understands me the one that accepts me for who I am BUT there is a problem with our marriage and that problem is the United States Government. They say my love and my marriage is not valid nor can I sponsor my wife to come live with me in Texas. They say I am a second-class citizen and I do not deserve the same happiness as any other married couple here in America. Most people ask me why don’t you move Lori, well here is the truth. I do not have an education. I have 3 Dogs that need me; I have an aging Mother who needs me. I have no where to live even if I did go to Montreal my Wife lives with her Ex and they share a home together and I cannot ask my wife to move away from here home and get an apartment while she works 2 jobs to support us because I am not legally able to work there until I am immigrated there which takes thousands of dollars we BOTH do not have and we are at an age where our health is of concern as well. I am diabetic and need medication to survive. So before you all think it is so cut and dry black and white we just do not have the Money to do this. I have been trying to start a business to help support myself and bring my wife here even if it is only 6 months at a time. A business is the only solution for us. It takes money to live and the bills will never stop just because she is here in the USA . I would have to pay her bills as well while she is here. Having a business is our only solution until hopefully one day the USA will stop it’s discrimination and allow me to sponsor my wife into the USA. I would love to go back to school and I have tried, but the cost of school is enormous and I cannot afford to start all over at my age of 46. I am in finacial debt already from having to purchase plane tickets and hotel lodging from traveling back and forth for 4 plus years now. I am in tears most days missing my wife, I spend every holiday alone and every night praying that LOVE will prevail. I ask myself will my life story ever have a happy ending? Please help support the destruction of DOMA! Please help us! Thank you for reading my story I hope and pray that I have opened up your hearts to help and stand up for me and all Bi-National couples out there that are struggling and needing your voice and strength. Change takes an army of people both gay and straight. My sincere wish is for ALL of you to find LOVE and keep it close to your hearts and never take it for granted! Love starts with us..... lets end the hate! Lori - You have gone through so much pain in your life it is unbelievable that you could even survive. Then, after pulling yourself up time and time again, you are once again failed by the very society that claims to believe in equality, who presents itself as compassionate, and who claims tobelieve in embracing all of humanity - the United States. It is a darned shame, and however encouraging it may be or is meant to be, I am sure it is hard to hear people say that things will change "one day" - people who may mean well, but who really have no idea what it is like to go year after year missing birthdays, anniversaries, shared sunsets and simply sitting at the table enjoying a morning cup of coffee with the person they love. Good luck to you, and I do hope this madness ends very soon.